Dolphins are “opportunistic” feeders, meaning they will eat those fish, squid and crustaceans (such as shrimp) available to them at that time. The variety of foods available is dependent upon the geographic location of the feeding population. Dolphin populations living along coastal areas tend to eat fishes and invertebrates which live on the coastal bottoms. Dolphins living in deeper parts of the oceans tend to eat fishes and squid which swim in the marine mid levels. Adult dolphins eat about 15-25 pounds of food per day (about 4-6% of their body weight), with nursing cows eating over 30 pounds per day (about 8% of their body weight). Food is swallowed whole, usually head first to make the swallowing process easier and less abrasive to the animal. The dolphin's esophagus is somewhat elastic so as to accommodate this process. It does not chew its food and does not swallow salt water in the process. Salt water is forced out of the mouth just prior to swallowing its food. Fresh water, a requirement of all mammals, is obtained solely by way of its food, fish and squid being composed of about 70% water. In the captive habitat the fish and squid to be fed each day are thawed. 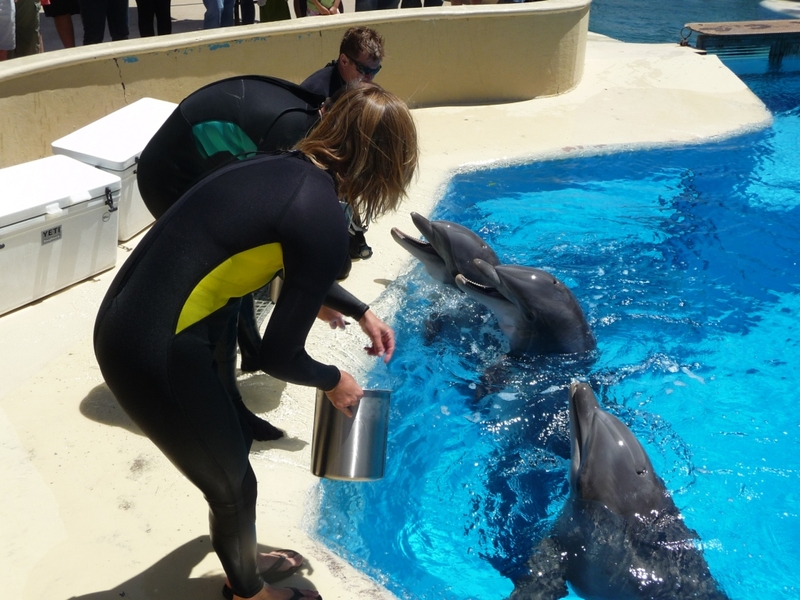 The amount of food to be fed each animal is determined by the individual dolphin’s dietary requirements and is placed in individually labeled cans. Each dolphin has its own feed canister. The food is kept on ice throughout the day to maintain a temperature which inhibits spoiling. Each day an adult dolphin produces about 4 liters of urine and about 1.4 kilos of feces. Because the volume of fluid produced during each urination episode is small, the urine quickly disperses in the water and is un-noticeable. Feces, on the other hand, usually appear as a cloud of thin green liquid. Only when a dolphin is not eating, or when the animal has not eaten for a number of hours, do its feces appear even semi-formed. In these cases the waste appears as brown mucoidal strings which hang in the water and do not quickly disperse. A bottlenose dolphin’s stomach consists of three compartments or chambers. (Most dolphin species have a three-chambered stomach, although there are a few species with only two stomachs). The first chamber, acting as a "storage unit", is responsible for holding swallowed food until the other two chambers are ready to proceed with digestion. In this way a dolphin is able to rapidly consume large amounts of food. In an animal with only one stomach (such as the human), food must be consumed more slowly so as to allow it to enter the stomach through the restrictive esophageal sphincter. The second stomach of the dolphin functions much like that of the human where enzymes and hydrochloric acid are released to accomplish much of the digestive process. The third stomach retains the now digested food until it is passed to the small intestine for absorption into the circulatory system as nutrients for cellular metabolism. The openings between these three stomachs are quite small. These small openings make it difficult for a dolphin to pass any foreign objects that may be consumed. The inability to pass foreign objects is often responsible for dolphin deaths, further highlighting the importance of not discarding materials in our waterways. Occasionally during feeding of captive dolphins, a fish will not be eaten by an animal and will sink to the bottom of the pool. This fish is quickly removed by the training staff. This is done so that the dolphin does not learn to eat things at the bottom of the pool, whether it is a perfectly good fish or a potentially harmful foreign object. The majority of feeding in the wild takes place in the morning and in the late afternoon hours. Feeding occurs by a number of different strategies. A dolphin may just chase down fish. Or, it may slap its flukes or pectoral fins near a fish to stun it and then consume it. This is called "kerplunking". A dolphin may frighten fish up onto the shoreline, slide out onto the beach and consume the fish, then slide back into the water. This method is called “strand feeding”. Such strand feeding requires the dolphin to slide out onto a solid surface on its right side. This interesting behavior is probably due to the fact that its esophagus (the tube leading from the mouth to the stomach) lies toward the left side of the animal's body. Sliding out onto its left side would compress the esophagus and make it more difficult for the dolphin to swallow its prey. In the following National Geographic video Atlantic Bottlenose Dolphins are filmed strand feeding on the salt marshes of South Carolina. Dolphins have also been observed "mud plume feeding". Using their flukes to stir up muddy bottoms and confuse fish, the dolphin is able to more easily feed on prey that could normally evade it. "Corralling" is a method by which fish are chased into shallow water where they are more easily caught and eaten. Adult female dolphins in the waters off Australia have been observed using "tools" to feed. They will break off a piece of sponge and cover their rostrum with it. The sponge protects their beak when foraging for food along rough surfaces and from spines of sea animals. Female dolphins will teach their daughters this method, but they do not appear to pass this skill on to their male offspring. Another form of tool use is to perform a sort of sexual display holding weeds and sticks with their teeth. Tool use by marine animals is much more rare than tool use by animals living on land. Following schools of birds can assure the dolphin of an easy meal. It may also follow fishing boats, consuming fish parts and whole fish discarded by the crew. Finally, dolphins can work together to feed. By cooperatively encircling a school of fish, dolphins drive the fish into a tighter and tighter concentration called a "bait ball". While some of the dolphins keep the fish in this ball, others take turns diving into the ball to feed. Bait ball feeding requires refined communication so that one particular dolphin does not get an undue share of food and that the dolphins spend equal time herding and equal tim efeeding. When part of the bait ball breaks off, certain dolphins will leave to return the missing part of the bait ball to its original location. "Cork screw feeding" occurs when dolphins dive to the bottom of their environment and cork screw their rostrum into the substrate (bottom) to force buried fish or crustaceans to expose themselves. Often dolphins stun buried fish using their loud echolocation clicks so that the exposed fish is more easily caught. In captivity we often see dolphins "performing" bows, fin slaps, cork screws and slide outs which may appear to be tricks taught to them by trainers. In fact, these are natural behaviors (such as used in these feeding methods) which are only being reinforced. In this video a dolphin simulates strand feeding behavior by sliding out onto a solid surface in response to a trainer's hand signal. Having a multitude of feeding strategies demonstrates the dolphin's capacity to remember - using its memory to remember what works to find food and what doesn't. Dolphins also feed as “casual observers” of fishing operations. This tendency has resulted in the often inadvertent netting of wild dolphins. Tuna follow pods of dolphins because dolphins are better at finding prey than tuna are. Using speed boats, tuna fishermen chase schools of 50 to several thousand dolphins for 20-30 minutes, herd them together, and then encircle them and the large number of tuna companions with seines. Unless the dolphins are let out of these seines before harvesting the tuna, the dolphins will not be able to surface for air and will drown. From 1959 to 1972 it is estimated that 4.8 million dolphins were killed by tuna fishing practices. In 1961 alone, 534,000 were killed this way. Today, efforts to avoid the accidental “by-catch” of dolphins (especially in the tuna fishing industry) have been effective. The NMFS (National Marine Fisheries Service) stations observers aboard fishing fleets to monitor tuna fishing practices. 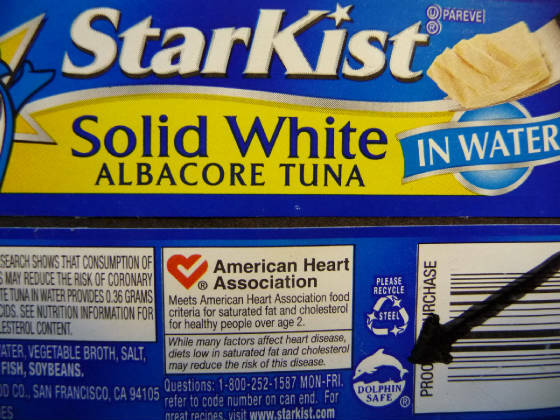 The major tuna production companies now label their product as "dolphin safe", meaning they have taken such steps to limit or prevent dolphin by-catch. Finally, and tragically, dolphins have become more and more dependent upon humans providing food to them in the wild. This inappropriate and illegal practice of people feeding wild dolphins robs the animal of its natural instinct to feed and may result in the cow not teaching her calves to feed naturally. It also results in serious bites inflicted by the animal on its human visitors.